Snowflake ornament wire forms are a lot of fun to bead up and hang on a tree at Christmas time, but they’re also fun to bead up and wear! 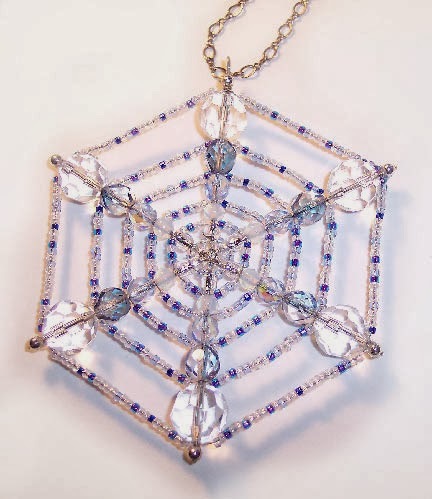 To make a snowflake pendant rather than an ornament, I chose the smallest size forms available, but you can easily use the larger ones and clip off the excess length with wire cutters. This pendant looks equally good hanging from a matching beaded necklace or from a plain silver chain. Try different color combinations too: who says that snowflakes have to be blue and white? The step by step photos that I've included use a different color combination, mostly so that the beads would show up better in the photographs, but wouldn't it be fun to have snowflake pendants in lots of different colors? 1. Cut a manageable piece of 28 gauge wire. I found 2 ½ to 3 feet to be enough, and still to be easy enough to handle. If your wire breaks or isn't long enough, it’s easy to add an extra piece, so don’t cut this piece too long. Anchor one end of the wire to the center of the snowflake wire form by wrapping it around several of the spokes. 2. Starting with the smallest set of 6 beads, slide one down the 28 gauge wire and also down the first spoke (the red beads in figure 1). Push the bead down to the bottom of the spoke and make sure that all of the thinner wire has been pulled through. String one 11/0 bead (the gold beads in figure 1) on the 28 gauge working wire, and slide another of the set of 6 down the next spoke. Wrap the working wire over and around the second spoke. Continue adding beads in this fashion, wrapping your way all around the wire form until you get back to the beginning. Wrap the working wire over and around the first spoke to finish the row. 3. 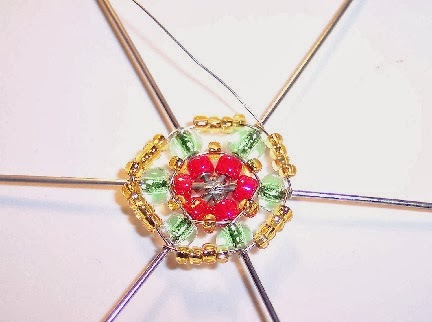 “Step up” to start the next row by sliding a bead from the next set of 6 (the green bead in figure 2) down the 28 gauge wire and also down the first spoke. Repeat the wrapping from spoke to spoke, adding as many 11/0 seed beads as necessary between spokes. 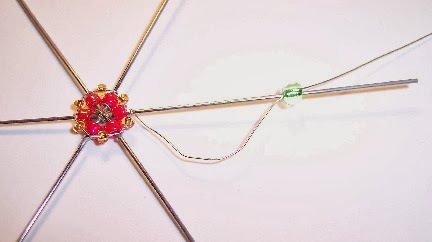 The wire wraps will hold each new spoke bead in place (figure 3, below). When you reach the beginning again, wrap around the first spoke and “step up” to the next row. 4. 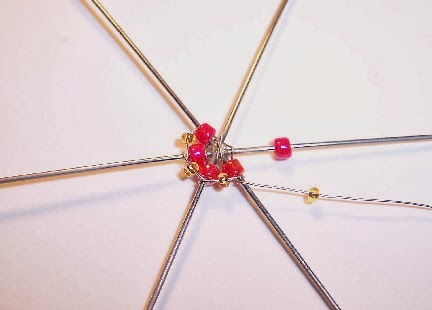 If you ever find that the beads you have chosen for the spokes have holes that are too small to accommodate both wires, simply wrap the 28 gauge wire around the spoke well, clip it off, and re-anchor it above the new spoke bead. 5. When you've wrapped your last set of beads into place, add a dab of E6000 glue and a silver-toned metal round bead above each final wrap. Push the metal beads snugly into place and let the glue dry. Clip the spokes off even with the tops of the beads and file the rough spots, except for one spoke. Turn a loop from the remaining spoke, using your round nose pliers (figure 4).